Titanium is hypoallergenic which means very few people have skin so sensitive that they will react to it – unlike gold or silver where reactions are quite common. 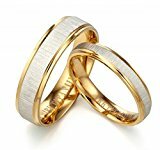 Titanium wedding rings, the metal has many uses since it has excellent corrosion resistance due to the fact that when it is scratched or machined, the surface forms a protective oxide layer almost instantaneously. Titanium is as strong as silver but with around half the weight making rings made from this material some of the most comfortable to wear. Also, it will last a lifetime if not seriously abuse with hammers and spanners. Gemini’s Jewelry has been dedicated to creating elegant and long lasting jewelry for over 20 years. We have offices located in the United Kingdom, United States, Germany, France, Australia, and Hong Kong from which we provide express service for our customers. We aim to give you professional service to ensure you are satisfied and we guarantee a 100% refund if you are not. At Gemini’s Jewelry, our customers are our priority. We specialize in using materials that are durable and affordable, bringing high quality jewelry to you at a price the average consumer can afford. If you are looking to purchase beautiful, high quality jewelry without breaking the bank, Gemini’s Jewelry is your new best friend.